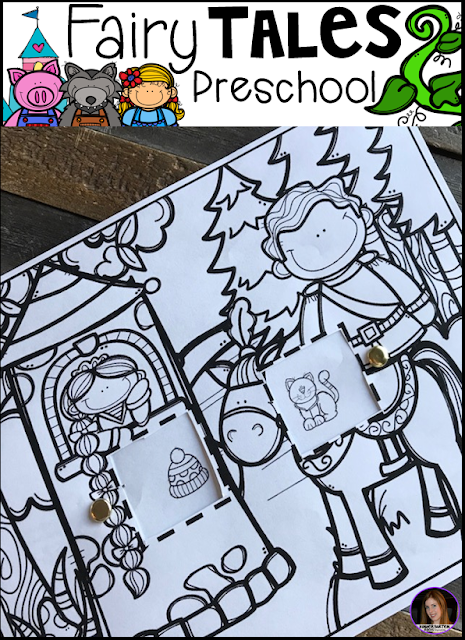 Are you looking for fun centers and activities that you can use with your fairy tales themed unit that revolves around your favorite fairy tales? 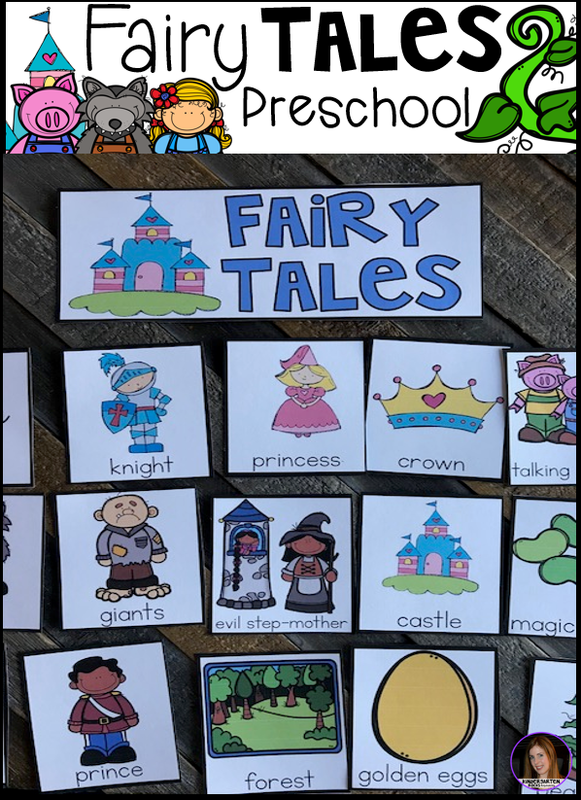 Then, you will love Fairy Tales Themed Unit for Preschool. This unit will not only help children learn new vocabulary, it will also help them learn and build important concepts and skills like common themes of fairy tales, name identification, number identification, increased story comprehension, literacy and math concepts, fine motor skills and the ability to follow multiple step directions. 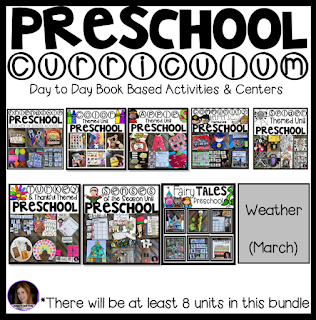 This unit is set up for a more structured preschool (kindergarten readiness), but all of the activities can be adjusted to meet the needs of an open-ended or home school structure. Fairy Tales Themed Unit for preschool is recommended for ages 3 ½ to 6. 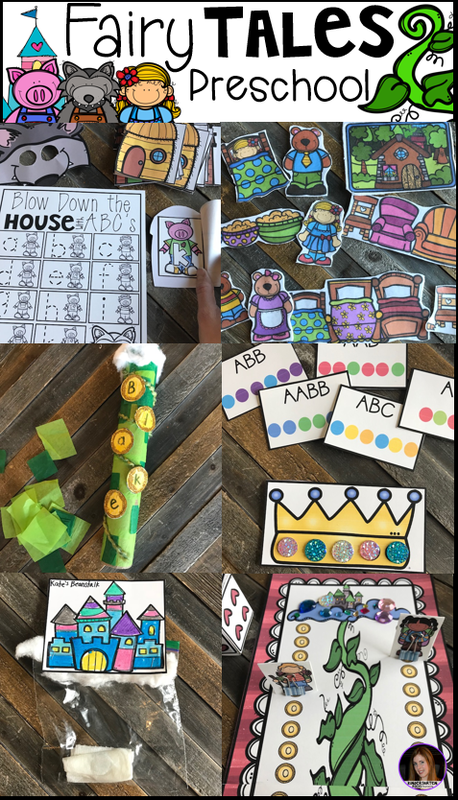 Here are some of my favorite fairy tales activities included in the unit! The boys and girls will learn about common themes in fairy tales and build their fairy tale vocabulary. 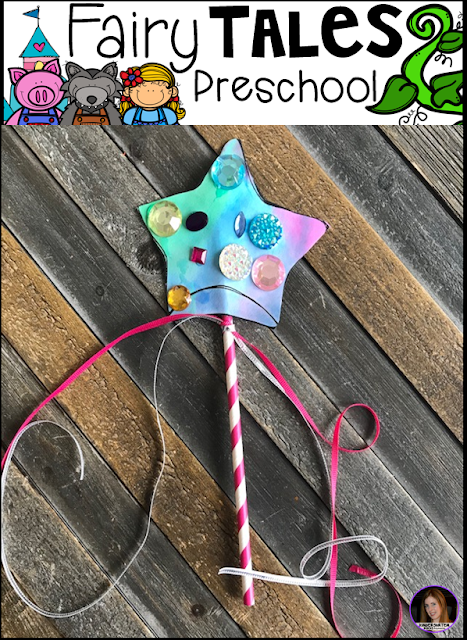 The boys and girls will share everything they have learned about fairy tales with their family when they come home with these cute crafts. Bleeding tissue paper is a blast! 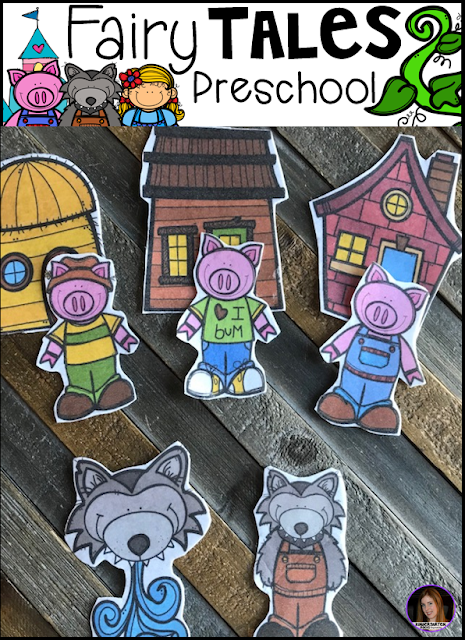 We love to retell the story using these cute flannel board pieces! They were easy to make using iron-on transfer paper and flannel. Our favorite activity was Blow the House Down with ABC’s. 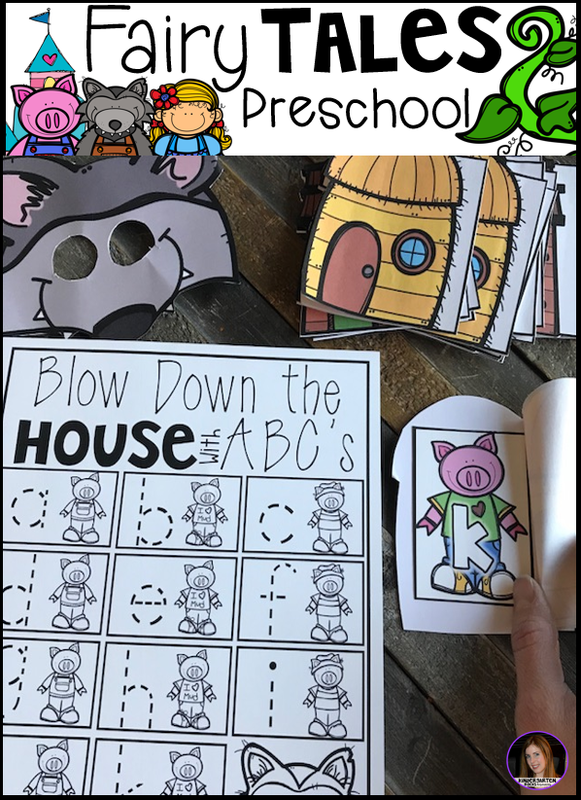 The boys and girls pretend to be the wolf and blow open the pigs houses. Then, the identify the letter and trace it on the printable. 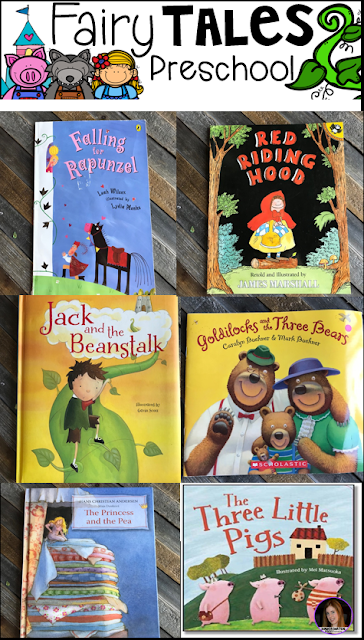 Falling for Rapunzel by Leah Wilcox is one of our favorite rhyming AND Rapunzel books. After the boys and girls try to guess all of the rhymes in the book, they make a Rapunzel rhyming game. 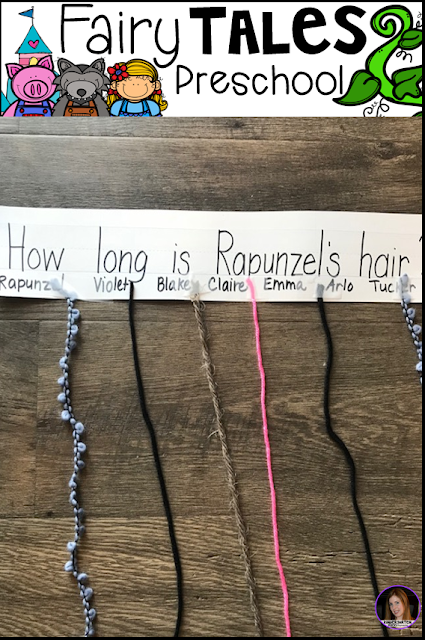 The boys and girls work on measurement and estimation with How Long is Rapunzel’s Hair. Choose how long Rapunzel’s hair really was and the boys and girls will estimate how much yarn they will need. 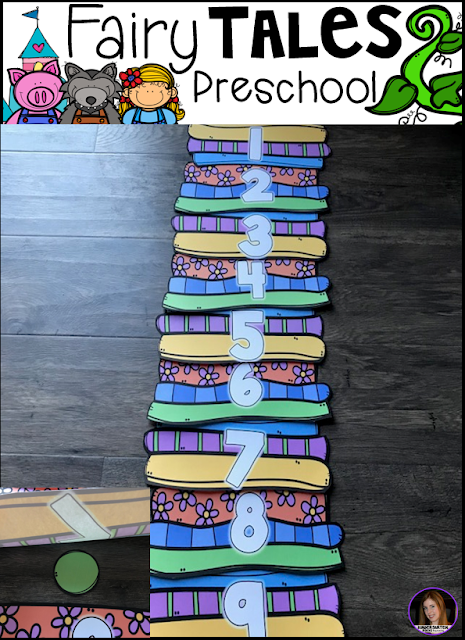 Then, hang the hair on a sentence strip with each child’s estimate and analyze the data. 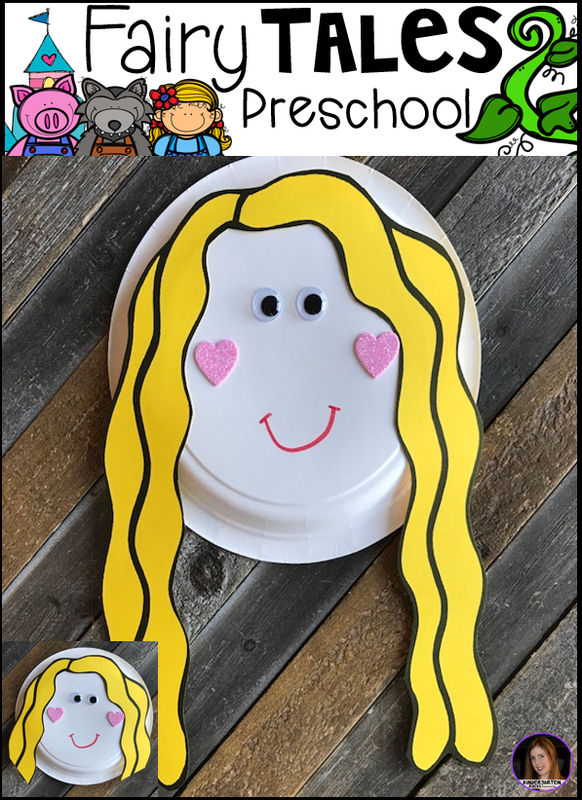 Then, the boys and girls will cut out Rapunzel’s hair and glue it to the paper plate. 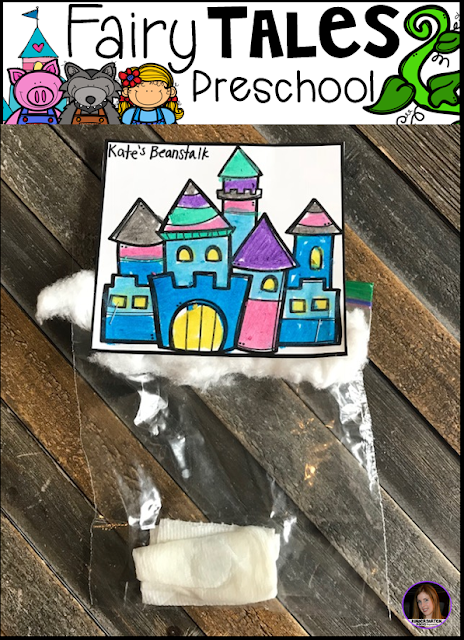 In the story the boys and girls find out that Rapunzel has a back door and stairs, so she no longer needs her long hair. We had fun giving her a hair cut! The hair and plate can fit the needs of the students in your classroom or children at home. y will take turns rolling the dice and counting how many spaces they will climb up the beanstalk. The first one to the top gets the treasure! 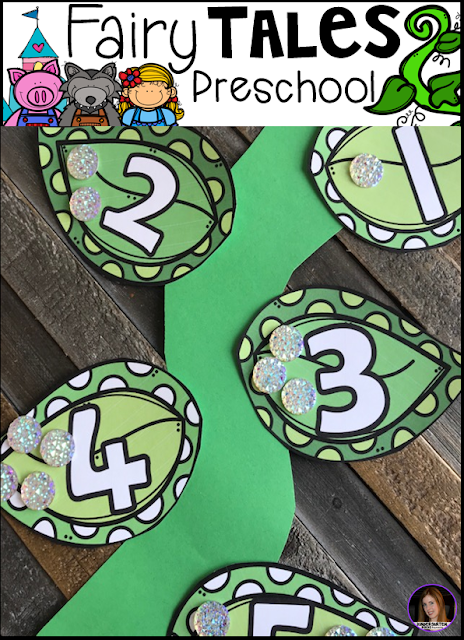 The boys and girls will work on one to one correspondence with this cute counting activity. 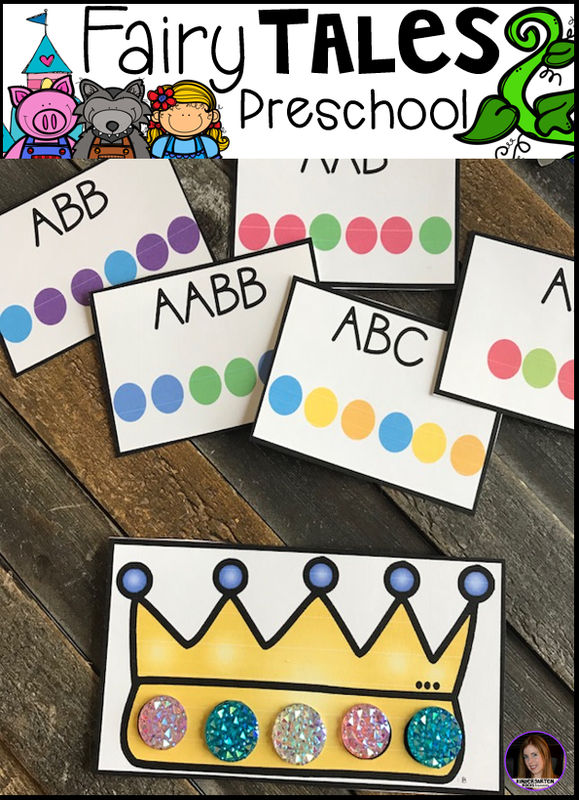 This would work well in a large or small group or at a center. 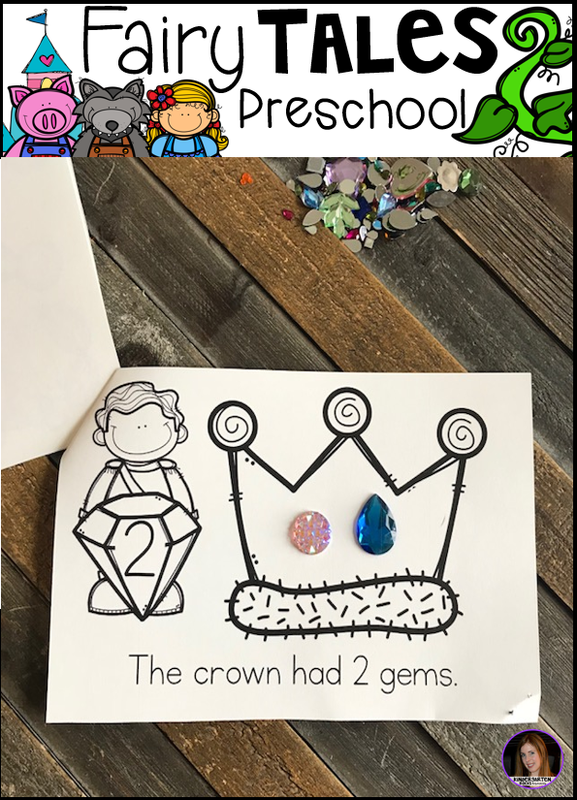 Place real beans or gems at the center as well. 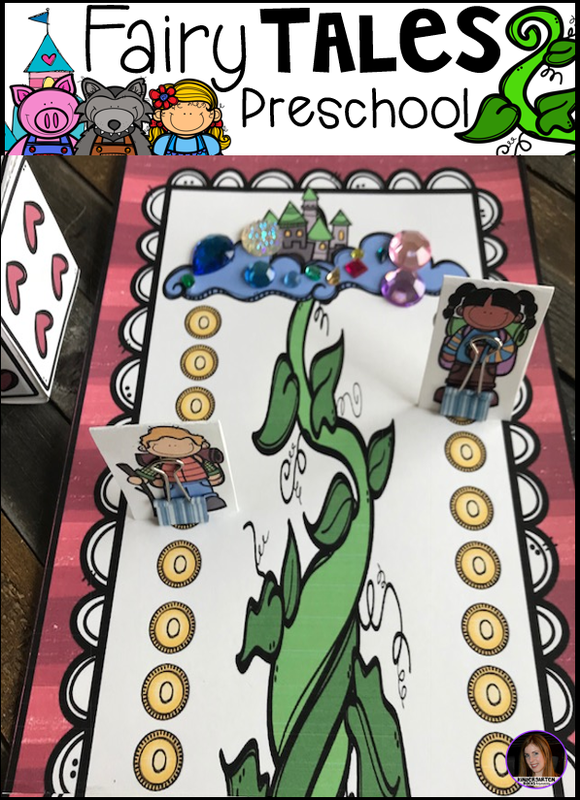 They will identify the numbers and place the matching number of beans on a leaf. 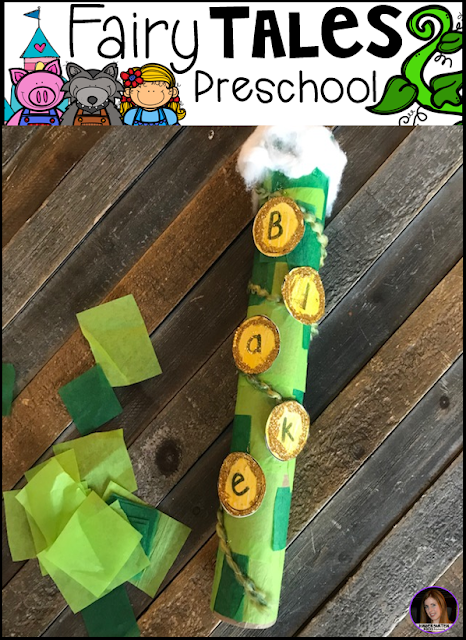 The boys and girls will watch their beanstalks grow all the way to the castle. The boys and girls will also have fun building this cute name beanstalk. 123 Where’s the Pea? 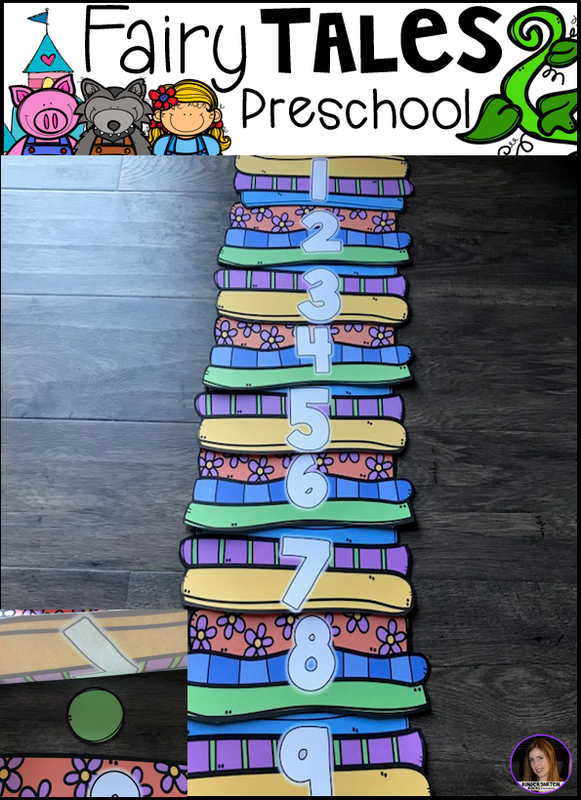 Is a fun game to play to review number identification after reading The Princess and the Pea. 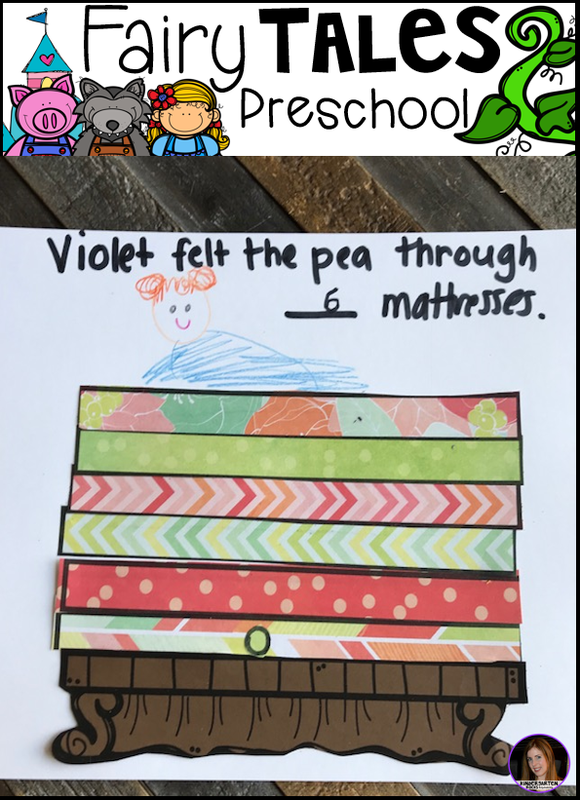 How many mattresses would it take for the children to feel the pea? 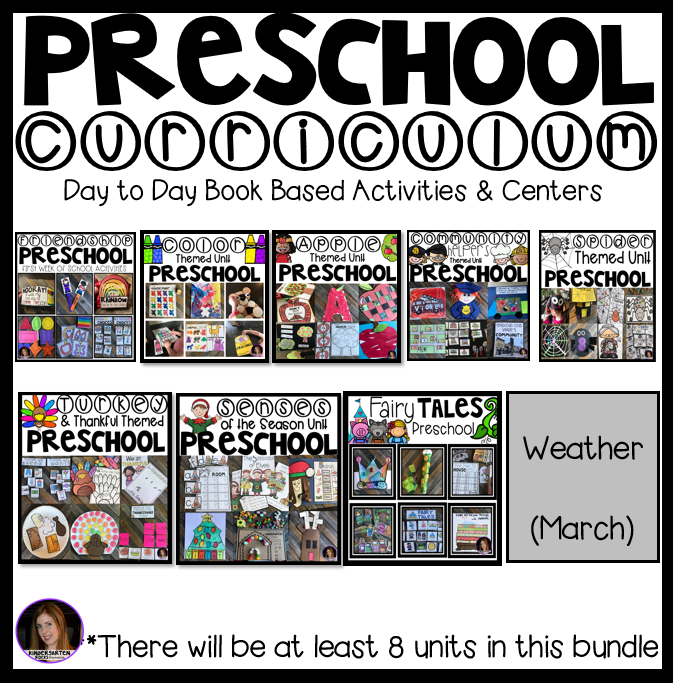 This activity keeps the boys and girls talking about the book! One of the centers included is Roll and Cover the Crown. 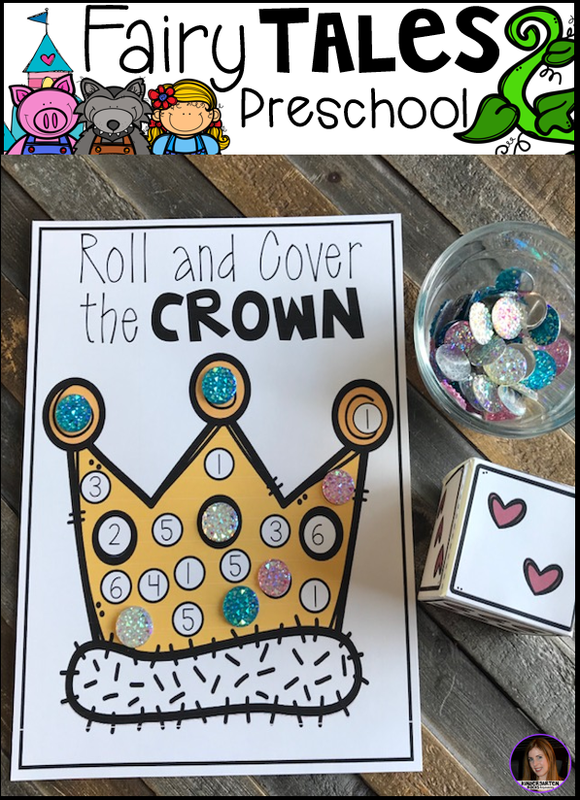 The boys and girls will roll the dice, count the number of dots. Then, they will find one of the matching numbers and cover it with a gem. They will continue to work on number identification and matching number to sets. 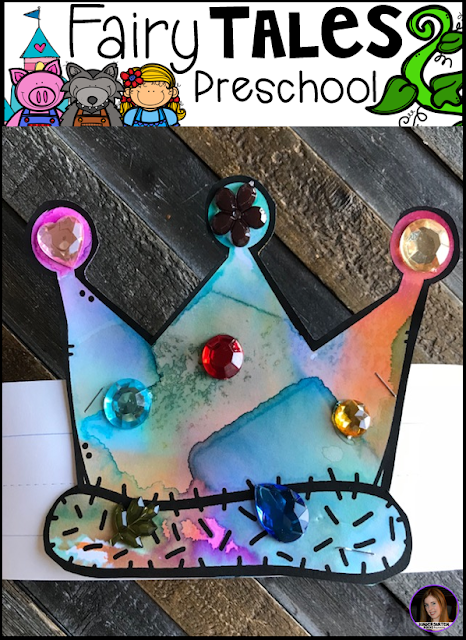 The boys and girls can also work on patterns with these cute crowns and pattern crowns.